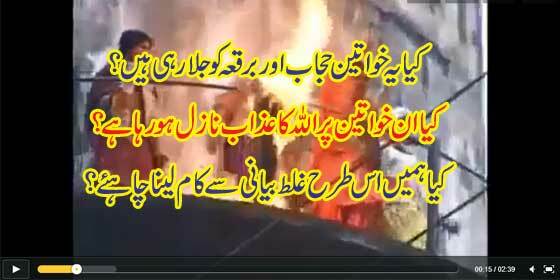 People sharing a video on social media by the title that women protesting against Islamic Hijab and Burqa were punished by God and burnt them. But these are the wrong statement about this video and misguide the people. The true story is that these women are not protesting against Hijab and Burqa but protesting against their government; to allow them to appear again in 12th class examination to improve their numbers for getting Elementary Teachers Training (ETT) course. Detail and background of this incidence is that Indian Woman Kiranjit Kaur Attwal along with 369 teachers are getting Indian Rupee 1100 per month from Punjab Government’s Education Guarantee Scheme (EGS). If they completed the Elementary Teacher Training (ETT) course then they will be able to get Indian Rupee. 20,000 per month. Eligibility for the Elementary Teachers Training (ETT) course is that teachers must be 12th class pass with a target marks. These women teachers could not get that target marks in 12th class examination to get Elementary Teacher Training course. So she wanted to appear again in 12th class examination to improve their marks. But government did not allow them to appear in exam again. So on February 7, 2010 Kiranjit Kaur Attwal along with three other teachers went to the top of 85 feet water tank tower in front of Education Minister home. They threatened that if their demands were not accepted then they will commit suicide by burning themselves. But government did not consider their demands; and police officer abused them and told to stop their 'Natak'. When these women find no result of their protest, they put petrol on their body and try to burnt themselves. They first put on match, but due to wind the match was blow off; so they soaked one 'Shawl' with petrol and get it flamed. The flame blow on and the women back due to fear but Kiranjit Kaur Attwal who caught the bottle and of petrol get flamed their soaked clothes and burnt. Next day Kiranjit Kaur Attwal died in hospital. An enquiry against police officer has been taken. Government given Indian Rupee ten Lakh to the family of Kiranjit Kaur Attwal as a compensation and a job in police to her brother. All 369 teachers are allowed to appear again in class 12th examination to try again for Elementary Teachers Training (ETT) course. The video of these burning teachers are posted on internet and sharing on social media by the title that these Indian women are prostesting against Hijab and Bura or Abaya; and they were burnt due to punishment by God. As you have learned above the whole story that this is not a protest againt Hijab and burqa or Abaya.